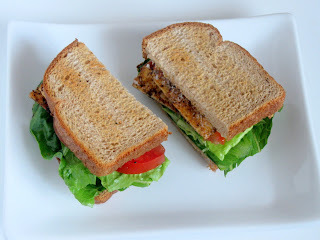 I am so excited about this recipe that you guys almost got Tofu Tuesdays last week. I found this recipe in the Penzey's catalog. If you've never seen it and you love spices you should check it out. It's sort of addicting. They have so many awesome spices, herbs, and extracts. I will say I was a little unsure of how this recipe would turn out even though I'm a fan of tofu and it's amazing if I do say so. My husband even chopped up some of the leftover cooked tofu pieces and put them on a salad. He likes two meats when possible so if he likes it (and said we should make it often because it's pretty easy) then it has to be good! While I was at Penzey's I also picked up some powdered lemon zest that I'm super excited about. I am thinking of putting some of it in whipped cream. My husband is making me strawberry shortcakes tonight and it's going to be delicious in whipped cream topping those, yes? 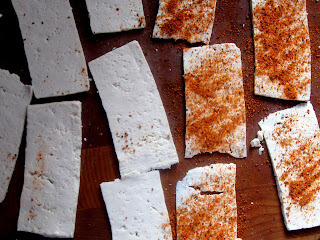 The tofu uses Mitchell Street Seasoning which according to the website is "Hand-mixed from: salt, Tellicherry black pepper, paprika, sugar, garlic, onion, dill weed, lemon peel, cardamom, citric acid, natural smoke flavor, allspice." It's a steak seasoning that's delicious on tofu! My husband has a few other Penzey's "meat seasonings" that I'm eyeing now. :) I figure if you can't get your hands on the actual seasoning then now you have an idea of what's in it, but of course you can use whatever seasoning that you want to. The Penzey's seasoning adds a bit of a smoky flavor though that is really nice. 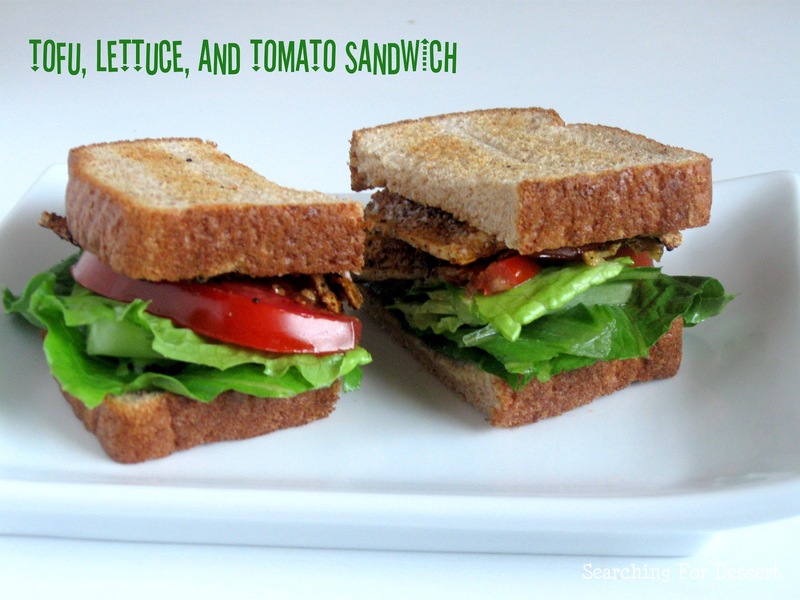 Like I said at the beginning of this post, you can do so much with this tofu including make sandwiches, snack on it (I did), or chop it up and put it on salad. I'm sure the possibilities are endless. I even contemplated for a hot second tossing it in some brownies and seeing what happened. What? There are bacon brownies, it might be awesome. :) You ready to find out how to make it? Here you go! 1. Remove tofu from package and pat dry. If you haven’t worked with tofu often you should start with the extra firm tofu so it holds together better but if you are good with tofu then use firm. 2. Slice the tofu with a cheese slicer, knife, or mandoline (I used a mandoline) to about ⅛” thick slices. It shoud yield about 20-24 slices (I got 26 on my mandoline). 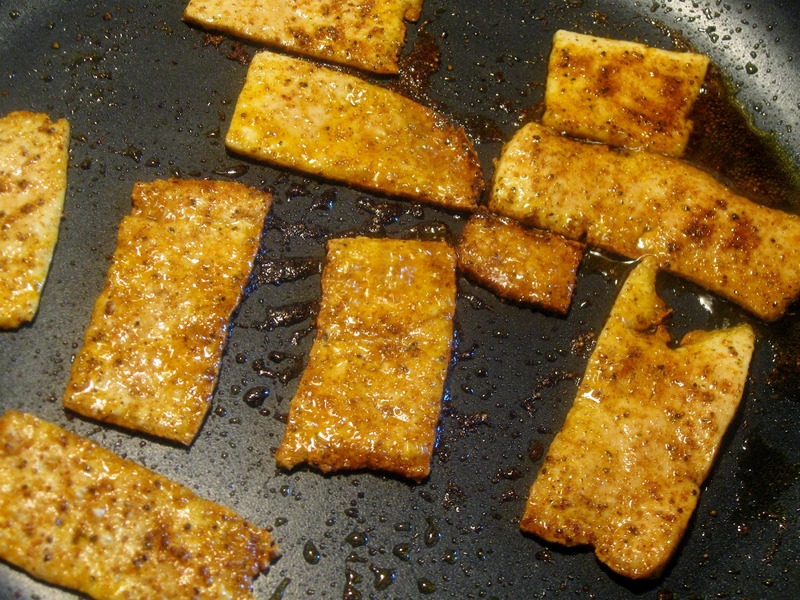 Blot the tofu with a paper towel so it’s dry on both sides. 3. Heat about 2 tablespoons of oil in a non-stick pan over medium heat. Season the tofu fairly heavily with Mitchell Street Seasoning on one side. Gently place the tofu seasoned side down into the pan (a spatula is helpful for this). Sprinkle the other side of the tofu with seasoning while in the pan and cook for 4-5 minutes, then flip carefully and cook 4-5 minutes more. 4. Optimal cooking time is about 8-10 minutes to get a golden tofu that is chewy in the middle but a little crunchy on the edges. Place the finished tofu on a paper towel lined sheet pan or plate. Cook remainder of tofu in the same manner. 5. Make the toast and cut the tomatoes while the tofu is cooking. Assemble sandwiches and serve. I have never cooked with tofu before but your way seems much more appealing than I have seen it done before.